I was excited to receive my copy of Stay Cool And In Control With The Keep-Calm Guru by Lauren Brukner; Illustrated by Apsley, a book dedicated to empowering children to regulate their emotions and senses. This book is geared for children and has a “early reader” book feel with the large type face and engaging and very effective illustrations. There are easy to follow symbols (I will make accompanying cards for easy reference.) The collection of body breaks and the checklist for the calming down process are excellent and very accessible. I personally love the included adjective charts-they are just great for empowering children to name their feelings. I also really appreciate how the book clearly defines the differences between physical, intellectual and emotional energies. So important in the quest for self control. The last part of the book is dedicated to the adults in these children’s lives and offers tips on how to support your child on their journey to self-discovery. The appendices are very helpful, offering various checklists, work sheets and visual sequences of the exercises in the book. I highly recommend this book. It is a great tool for working with the wide spectrum of students/children we encounter. It is filled with practical tips on ways to identify and cope with anxiety, anger and other difficult feelings. It will be very useful to help familiarize them with basic self-control techniques and to empower them with clear, accessible communication skills. Disclaimer: The publisher sent me a copy of this book. All opinions are my own. Categories: Always Be Dancing Mindful Movement | Tags: ADHD, Book Review, children, empowerment, healthy, kids, meditation, movement for everybody, peace, self esteem, social skills, special, stress, yoga, youth | Permalink. I am reviewing STARS Social: Skills Training and Readiness Skills by Lynn M. O’Dell-Pateman MA CCC-SLP, Kerry L. Walsh PT, MS and Jaime E. Meyer-McHale MS OTR/L. 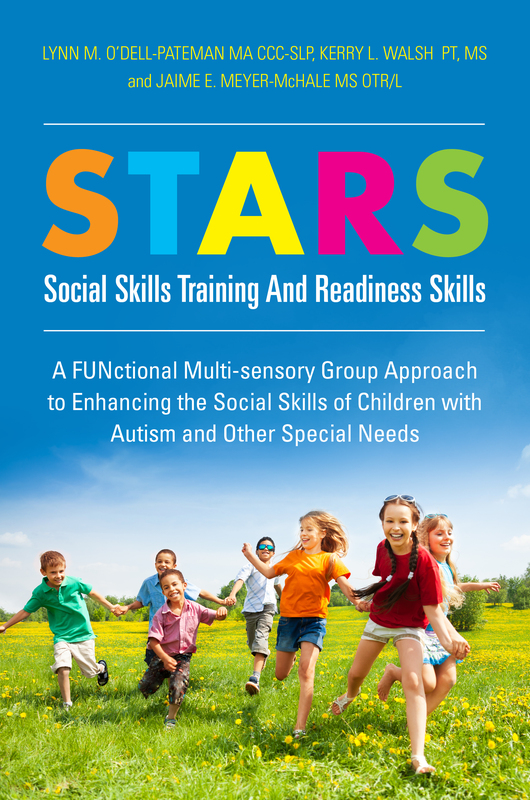 The STARS program declares itself as A FUNctional Multi-sensory Group Approach to Enhancing the Social Skills of Children with Autism and Other Special Needs. The three authors bring together their very distinct and different backgrounds (speech therapy, physical therapy and occupational therapy) to successfully accomplish this. This manual offers a variety of techniques, all very clearly explained, to ensure success for every child, no matter their individual skill set. All of the activities (warm-up, vestibular, proprioceptive, and cool-down) are broken down into three distinct levels to allow for every child to participate in the same activity modified for their age/skill set and the group lessons allow for flexibility to adjust to your groups specific needs. As a yoga teacher offering classes to typical and special needs populations, both privately and within the public school setting, I appreciate the multitude of ideas and activities the manual presents that I can integrate into my own classes to ensure that basic concepts for successful integration make my classes accessible to all students. I appreciate the convenient sensory based flow carts that I can use for visual summary and the pre-made progress reports are a plus for organization. The only thing I would suggest would be that the authors consider developing some type of color coding to make finding the skill set variations easier throughout the book. I highly recommend this book and see it as a necessary addition to libraries, to school teachers, yoga teachers, parents of children with special needs and to anyone who seeks to create a community of inclusion. Full Disclosure: The authors provided me with a copy of STARS Social: Skills Training and Readiness Skills to review. All opinions expressed are my own. Categories: autism, kids yoga, youth yoga | Tags: ADHD, Autism, inclusion, social skills, Special Needs, youth yoga | Permalink.